The majority of us use Google Keep, notes, to-do list apps on our phones to help us keep productive. Why? Because it’s obviously so much easier to type things on our phones, tablets and laptops/computers. I’ve been using Google Keep and Calendars to keep track of everything in my life from shopping lists, events, to-do lists and other timetables. I think keeping my university timetable is especially useful digitally, but I started to find that typing up what I want to do each day never worked. In the end, I never followed it and even looking at it didn’t motivate me at all to get up and do the task. During summer’s exams, I decided to hand-write a monthly spread with goals of modules/topics I wanted to cover as well as quizzes/practise questions I wanted to complete. Each module had different colours. I had this up on my wall on my desk as I studied; I found it helpful because when I lost focus, I’d glance over it and see what else I had to do before the day ended, this was easy with the colours (and only 4 modules.) After completion, I’d cross them out. And let me tell you, that was much more satisfying than tapping it as done on Keep. I remember showing my boyfriend a picture of it, excitedly telling him how much more work I’d done physically laying it all out and writing it. It was from this moment, I found out about Bullet Journals from him. I spent my breaks from revision learning about Bullet Journals, watching Bullet Journal videos (I especially love Boho Berry’s), stalking Bullet Journal posts on Instagram and Pinterest. After my first summer exam, I bought the LEUCHTTURM1917 notebook in Azure as a little treat and a way to keep in on track for the small push left. Starting my Bullet Journal was super exciting! But I have to admit, I might’ve gone over the top initially with lots of colours, doodles, quotes – all with the aim of making it look Instagram-ready as you can see below. After having it for over a month now, I’ve slowly been leaning towards a more simplistic design. 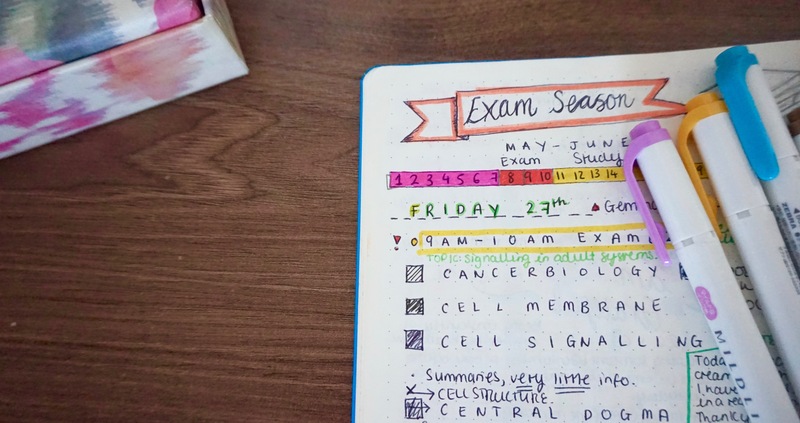 My May daily spread showing exam season! Although the journal can be seen as just a planner. It’s sort of a little more than that – to me at least. My journal is covered with my favourite quotes. This one I love especially – Motivated by it I’ve tried to fill up my extra time by being productive so have recently started Lynda courses! A place I can look back on what I’m grateful for: After each day, I note down one thing I’m grateful for on my “Gratefulness” page. Sometimes it’s inevitable to feel relatively deprived due to social media, but looking back at this page and reading it always erases that. ? A controlled shopping list: This has been organised by a “need” and “want” section – because let’s face it we don’t need everything we have on the shopping lists. This has helped me budget much more effectively, especially with my holiday coming up in under 3 weeks! A tracker: I use my Bullet Journal to track my overall mood for the day, sleep, water intake and the amount of exercise I do. Sure, there are useful apps for this but I find it motivating after I’ve jotted these things down to do something about it. A place I can write down my memories, daily events and just write: Like a traditional journal. I also write reflections on my performance at work such as sale targets. 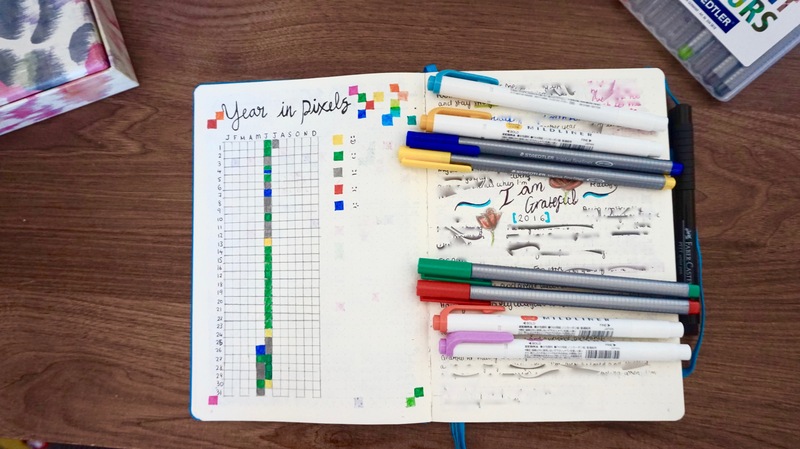 My “Year In Pixels” log and Gratefulness log (that I recently filled up and had to start a new one!) It’s blurred because most of it is quite personal but warms my heart when I read them again. ? As I’ve used my bullet journal more, I’ve altered how I initially set it out. This is probably one of my favourite things about the system: flexibility – I can change it, however, I like the next month or week or day. I love my Bullet Journal! It’s definitely increased my productivity. A lecturer at my university always tells my class that the physical act of writing is much more productive than typing – more information goes in and stays in. 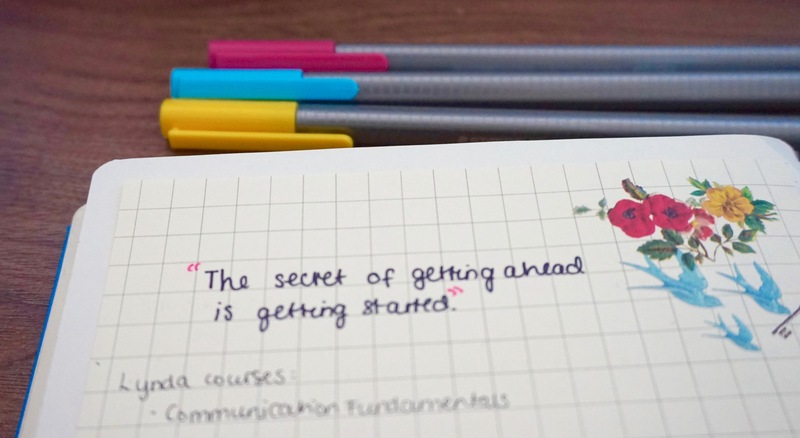 For me, my journal has proven this, I’m much more motivated writing than typing my plans out. 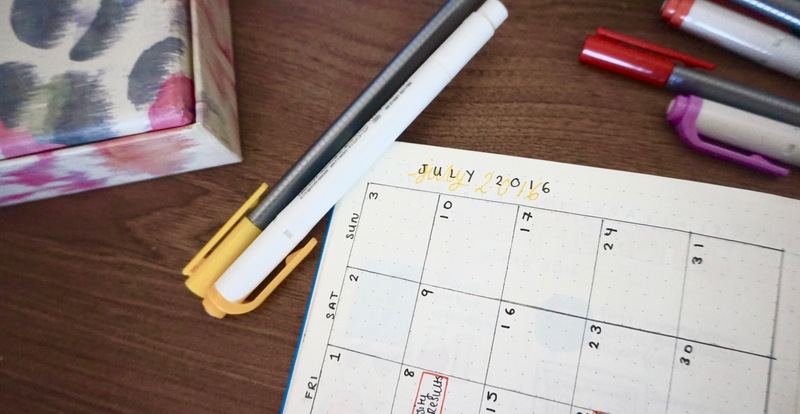 Don’t get me wrong though, I still love using my Calendar – it’s perfect for on the go when you don’t have much time to open up a journal! ? Do you prefer digital input of tasks or writing them down or both? 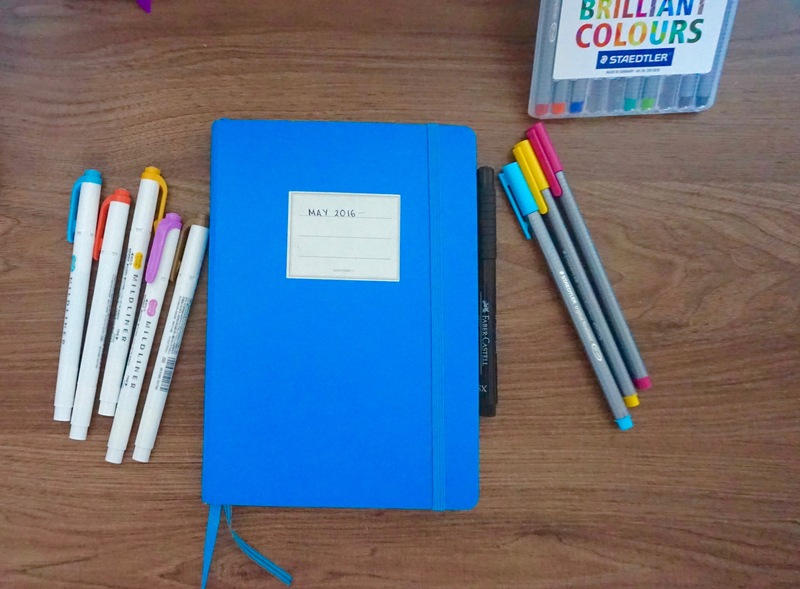 Have you heard of Bullet Journals before? Ooo, let me know if you do! I love seeing how creative people can get with theirs! When Tristan and I first started college, we were under the impression that we can remember any assignment, when it was due, and etc. However, we quickly learned that it’s impossible to remember all assignment due dates and etc. I believe (please correct me if I’m wrong?) that all colleges offer free yearly planners? I know mine does and it definitely helps us to stay on track of things. I actually love planners MORE than digital planners. I can definitely compare the two as I too have used both the digital calendar and the regular planner. I honestly love the regular planner MORE than the digital planner. Though, I’m sure there’s at least one person who likes to use the digital planner instead of the planner. I just find using a non digital planner more convenient because you don’t have to whip out your phone, unlock it, search for the calendar app, and type everything you need to have done and submitted by. It’s just a waste of time if you ask me. Not all colleges do, my old school did but not my current university! I’ve heard of bullet journals, and I attempted to start one, but I found the setup process quite long and confusing. I prefer a good old-fashioned handwritten list. It’s very satisfying crossing things off once I’ve done them! It sounds like bullet journals work really well for you. It’s always good to be organised – especially when you have loads to do. I just used to make lists on post-it notes for uni work, and put the deadlines in my diary. So glad I don’t have to do that anymore! Some of the things I used to post on my Tumblr were horrific. Every time I was upset about anything I’d go into detail. And, of course, it was always really one-sided! Thank you for leaving questions on my blog. I’m going to do the vlog after I’ve moved house next week, because I currently have piles of boxes everywhere and it’ll just look horrible. 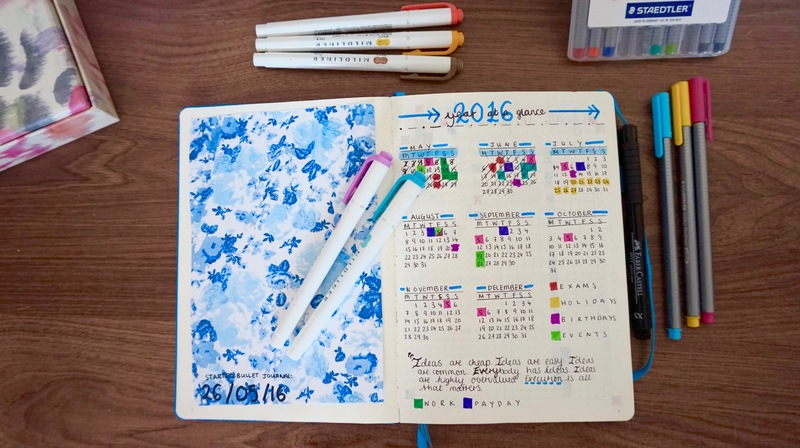 I looked into Bullet Journals before, and it’s really nothing something I’d use. For my own planning and productivity, I use Todoist as my digital planner and I use a monthly Ardium planner. I like using Todoist to list everything that needs to be done, but my Ardium planner gives me the monthly bird view of things. The latter especially comes in handy for my blog post schedule! I’ve heard of Evernote, I’ve got it downloaded and will try it out today ^_^ I started planning blogs, I didn’t used to and just blogged whenever I felt like it but it’s kept me on top of my blogging game for sure! Hey Pauline, just came by your blog through Liv’s blog’s comment section. Trying to start up a blogging circle again, which I had somewhat lost over time. Although I haven’t used bullet journal before, I have a small notebook I keep in my purse that has 5 different sections for different types of notes. I also keep digital notes with a bunch of One Note notebooks that have multiple tabs and sub tabs. I have a digital calendar that syncs across devices, but sometimes like to have a list of stuff coming up rather than the calendar format. I started using start.me last (https://start.me) last week and it’s like a digital cork-board where you can put blog feeds, news feeds, weather, calendar, notes, and to-do lists etc. Writing them down sure helps me and that’s why I get planners <3 I even ordered some kawaii ones, and that's fine. I love the cute ones!! I wanted to make my really personal and me so I opt-ed in for a Bullet Journal! I’m glad you’re making use of being productive through digital means and on a planner. Wow, I just realized there’s a ton in there…. everyone should bullet journal, really, haha. They’re the best. Google Keep is a life saver in planning things out! I love using it to plan out the different details with my blog XD. Though, I do have a problem with typing entries into a digital planner @[email protected] Haha, I have a problem with trying to find the perfect color for the topic XD. For some reason, I don’t have that problem in real life! 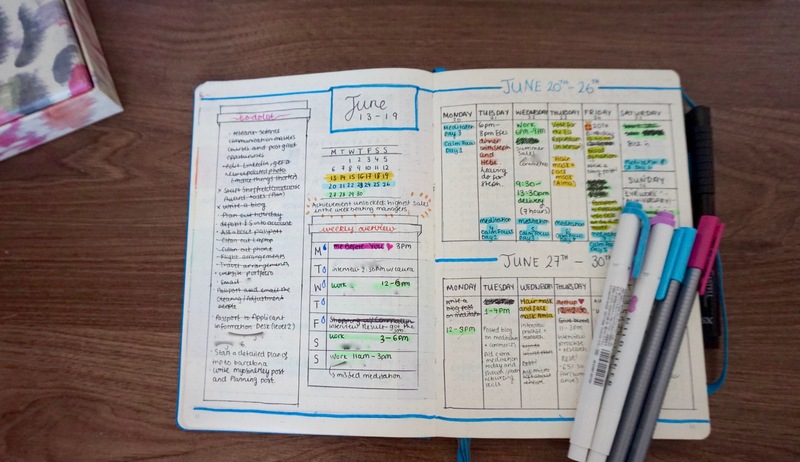 I always admire people’s ability to keep up with a bullet journal flawlessly. Knowing me, I know I will mess up along the way. Everything looks soOOooo neat on yours! Looking forward to see what it looks like at the end :D. I agree with your lecturer, I always found myself remembering things easier when I write it out compared to typing things. At the moment, I am keeping things in a planner :)! I prefer digital, though I have tried bullet journalling. Like you, I was initially writing tasks I had already done, just to feel good about crossing them off. I find myself constantly writing the same tasks over and over again, day after day, I think because I pack too much into my daily to-dos. I feel like taking another approach. I dislike planners with a monthly view because I prefer to use a digital calendar that I can move events around more easily in. I love writing, and I think that is why I wrote a lot of tasks over and over when I was bullet journalling. I didn’t have much to write about so I was just repeating it all! 🙁 I might give it a go again, but try a different approach. I need to find an approach that works for me. I first heard bullet journal from a blogger friend but didn’t have any complete definition of it so when I read your post I think Im interested especially that I like posting notes and I will now try to make doodles. This will help me to be productive at work. Maybe this can help me to be consistent with my goals and plans as I am such a moody person. When I am really down I tend to ignore the goal but I think creating a gratefulness page will help me get back on track. Really thank you for showing how you do it! However, in practice, I use my Moleskine weekly planner more than my bullet journal as much. The bullet journal is more of a journalling platform than it is a planner/to-do list. Maybe one day, I can jump over into the bullet journal completely. But yes, I’m also a major paper list/planner type of person. I might store things in apps temporarily, but it’s not done until I’ve transferred it to paper.